Seen the Affliction Georges St. Pierre Truth Tee yet? Represent the champ with this new masterpiece by Affliction. Printed on the front with a fleur de lys inspired design is the Affliction signature, “Live fast” and the name “Georges St. Pierre”. There’s also a Canadian flag with “Rush” printed on the lower right back. All of this combined with the quality that Affliction brings you makes for a great buy: The Affliction GSP Truth T-Shirt. 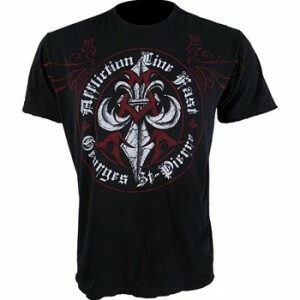 The Affliction Georges St. Pierre Truth Tee is available at MMAWarehouse for $57.99.